Home2019 Spring Titles: pre-order now! In three thematically linked essays, B.J. Hollars explores what harbingers might have been present in the lives of scientist J. Robert Oppenheimer before he invented the atomic bomb and civil rights activist Medgar Evers before he was murdered. He also considers his own overlooked portents in a static-filled universe. Taken together, these stories converge toward the humbling truth that life’s only certainty is uncertainty, and our harbingers—no matter how strong—only offer insight in the aftermath. In 2017, Bull City Press re-released Hollars’ In Defense Of Monsters. Writing Your Name on the Glass reckons with the duration of memory and the peculiarities of the present, tackling what it means to be both beloved and also subject to love’s grasp. 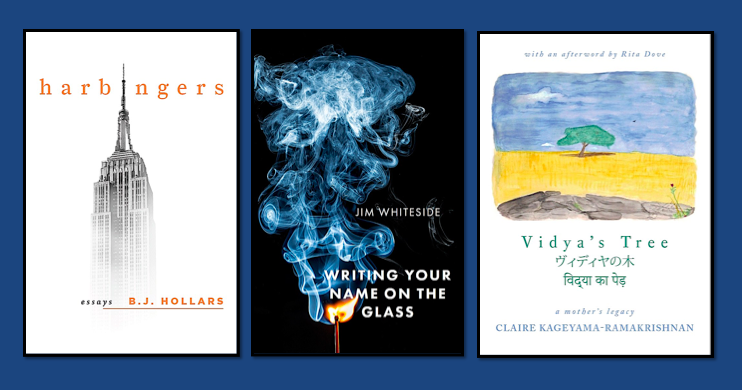 Joining the poetics of the queer south, Jim Whiteside furthers the conversation about identity, place, and desire in contemporary queer relationships. These elegant and precise poems document the process of reassembling broken pieces and finding one’s voice again. Writing Your Name on the Glass is the 2018 Editors’ Selection title from the Frost Place Chapbook Competition. This posthumous collection brings together some of the final poems of Claire Kageyama-Ramakrishnan. Featuring forewords from Jon Loomis and Adrienne Su and with an afterword by Rita Dove.